Cite page (MLA): "Introduction to the Edition." In Livingstone's Letter from Bambarre. Adrian S. Wisnicki, dir. Livingstone Online. Adrian S. Wisnicki and Megan Ward, dirs. University of Maryland Libraries, 2017. Web. http://livingstoneonline.org/uuid/node/8229df32-720a-4447-82e1-9f17f8de0d71. This page introduces our multispectral critical edition of the Letter from Bambarre, a harrowing letter that David Livingstone wrote to his friend and future editor Horace Waller on 5 February 1871. The page describes the significance of the edition and outlines its role as a pilot project for our critical edition of Livingstone's 1871 Field Diary. This edition of Livingstone’s Letter from Bambarre is of great interest to scholars of the British Empire, Victorian literature, African history, the history of medicine, and the digital humanities. Livingstone's previously unpublished letter of 5 February 1871 to his friend and future editor, Horace Waller, was the first nineteenth-century British literary work to be captured and enhanced with the multispectral imaging process. 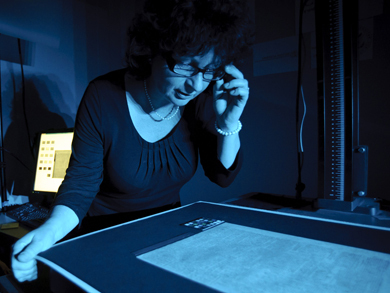 Spectral imaging, when used for the study of cultural objects, involves illuminating an object with successive wavelengths of light – starting with ultraviolet, working through the visible spectrum, and concluding with infrared – while capturing digital images and, later, processing the images in order to enhance select object features. When originally published in 2010, Livingstone’s Letter from Bambarre set a new standard for the range of data that a digital edition of a nineteenth-century manuscript could contain, as the edition (reproduced here) included a full textual apparatus and bibliography, alongside natural light images and multispectral images processed to enhance text and topography. A processed spectral image of a page of the Letter from Bambarre (Livingstone 1871c: pseudoratio). Copyright Peter and Nejma Beard. Creative Commons Attribution-NonCommercial 3.0 Unported. This page is the same one as above, but this image has been enhanced with spectral image processing to minimize the underlying printed text (page center) and to reveal Livingstone's writing. The edition of the letter also served as the pilot phase for an eighteen-month spectral imaging project (2010-11) on Livingstone's 1871 Field Diary, an iconic document that captures Livingstone's first-hand impressions of a horric slave-trading massacre in central Africa and that documents the months leading up to his famous meeting with Henry M. Stanley. Livingstone's Letter from Bambarre laid the groundwork for the 1871 Field Diary project because analysis of the letter – which was composed by the same methods and during the same period as the diary – demonstrated that spectral imaging could be applied effectively to study nineteenth-century paper-based British manuscripts.